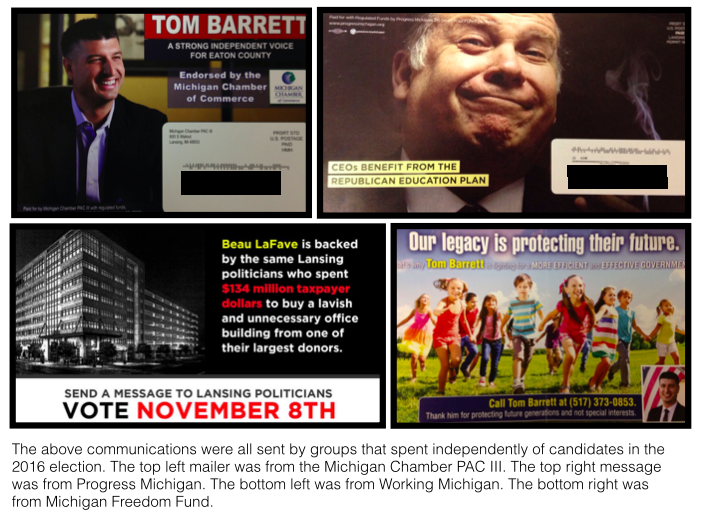 LANSING — Twenty of Michigan’s top independent spenders, which can accept unlimited contributions and expend unlimited amounts in elections, raised $9.9 million over the last two years. About half of that total can be traced to 12 sources. The numbers, based on an analysis of state campaign finance records from Jan. 1, 2015, through Election Day, Nov. 8, 2016, show how independent spending — spending not controlled by candidates — has been dominated by a select group of major donors and organizations. It’s a trend that’s also been seen at the national level since the U.S. Supreme Court’s 2010 Citizens United decision. In Michigan, the select group of funders was led this election cycle by West Michigan’s DeVos family, a handful of labor groups, the Association of Realtors and the Detroit Regional Chamber of Commerce. Nine of the 20 top independent spenders reported getting their money from fewer than 10 different sources total since the start of 2015. Seventeen of the 20 top independent spenders got their money from fewer than 50 different sources since the start of 2015. That’s different than many candidate campaigns that raise money from hundreds of different sources. The average contributor to the 20 groups that MCFN tracked gave $20,291. In comparison, individuals can give only $1,000 per cycle directly to a State House candidate and $6,800 per cycle directly to a statewide candidate. The independent groups have spent much of their money on TV advertisements, digital advertisements, mailings, paid canvassing of districts and other campaign work. Corporations and labor groups cannot make contributions directly to candidates in Michigan but can spend independently and can give to Super PACs. To give to candidates, they must raise money from members or employees. MCFN tracked the 12 committees that reported the most independent spending in races to the Secretary of State’s Office in the last two years and eight of the most active Super PACs, which also must act independently of candidates. There’s been millions of dollars in additional independent spending in Michigan over the last two years but that additional spending has been done by groups that haven’t had to disclose their spending or the source of their funds because the spending has avoided telling people expressly how to vote. In those cases, it's impossible to tell where the money is coming from. The following are the 12 committees that have disclosed the most independendent spending to the Secretary of State from the start of 2015 through Oct. 20 and the amounts of independent spending — not fundraising — they reported: Great Lakes Education Project ($476,269); Michigan Republican Party ($259,622); Working Michigan ($240,070); New Sheriff In Town ($231,574); Michigan Realtors Super PAC ($222,395); the Michigan Freedom Network ($197,692); Michigan Chamber PAC III ($195,039); Business Leaders for Michigan PAC II ($184,520); Turn Around Wayne County ($170,015); Michigan First ($160,515); Conservation Voters of Michigan Super PAC ($120,488); and American Federation of Teachers Independent Expenditure Committee ($76,499). The eight Super PACs analyzed and their fundraising totals for the cycle are the following: the Michigan Pipe Trades Association ($705,814); the American Federation of Teachers Solidarity ($678,019); Powering the Economy ($467,814); Policy Over Party ($250,000); Michigan Planned Parenthood Voters ($191,315); Progress Michigan Political Action Fund ($172,710); and Labors Local 1191 Construction Workers ($140,000); and Michigan Deserves Better ($121,450). Combined, the 20 groups have reported raising a total of $9.902 million at the state level since the start of Jan. 1, 2015. — DeVos family, $1.805 million: Members of the West Michigan-based DeVos family gave heavily to the Michigan Republican Party ($1.04 million), the Michigan Freedom Network ($250,000) and the Great Lakes Education Project ($500,000). 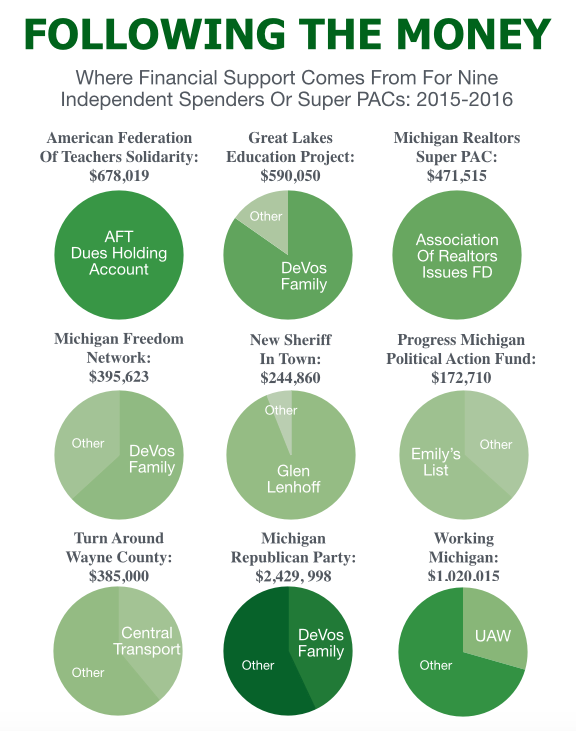 — American Federation of Teachers, $678,019: The American Federation of Teachers channeled $678,019 in union funds to Working Michigan, a Super PAC that supported Democratic candidates, and to the American Federation of Teachers Independent Expenditure Committee. — Michigan Association of Realtors Issues FD, $471,515: The Association of Realtors Super PAC received $471,515 from the “Michigan Association of Realtors Issues FD” over September and October. The Super PAC spent heavily in favor of GOP-nominated Supreme Court candidates and GOP House candidate Brandt Iden (R-Oshtemo Twp.). — Detroit Regional Chamber of Commerce, $421,913: The Detroit Regional Chamber gave $421,913 to a Super PAC connected to the chamber, Powering the Economy. As to where the chamber got the money, that doesn’t have to be disclosed. — United Auto Workers, $300,000: The United Auto Workers (UAW) chipped in $300,000 for a Working Michigan, the Super PAC that backed Democratic House candidates. Of the $300,000, $200,000 from the UAW’s Victory Fund and $100,000 came from the UAW’s Education Fund, according to the disclosures. — Engineers Political Education Committee, $250,000: The Engineers Political Education Committee gave $250,000 to a Super PAC called Policy Over Party. The Super PAC channeled money to Working Michigan and a federal Super PAC Defending Main Street. — Glen Lenhoff, $230,085: Lenhoff, an attorney, gave $230,085 to New Sheriff In Town, a Super PAC that attempted to unseat Genesee County Sheriff Robert Pickell. — Peter Karmanos, $190,000: Karmanos, the co-founder of Compuware and majority owner of the Carolina Hurricanes, gave $190,000 to the Michigan Republican Party’s state committee. — Michael Jandernoa, $170,000: Jandernoa, former CEO of Perrigo, gave $130,000 to the Michigan Republican Party’s state committee and $40,000 to the Business Leaders for Michigan PAC II. — Central Transport, $150,000: The Moroun family’s Central Transport gave $150,000 to Turn Around Wayne County, a Super PAC that spent at least $55,000 fighting Proposal A in the City of Detroit. — Pipefitters, Steamfitters, Refrigeration and Air Conditioning Service Local 636, $143,150: Local 636 gave $143,150 to the Michigan Pipe Trades Association Independent Expenditure Political Committee. — West Michigan Plumbers, Fitters and Service Trades Local 174, $105,614: Local 174 gave $105,614 to pipe trades independent expenditure committee. The pipe trades committee gave $110,000 to a non-disclosing account connected to the Michigan Democratic Party and spent additional funds fighting an effort to repeal the state’s prevailing wage.